Pairing food and wine is an exciting game and I love playing it! Though the rules are complicated, everyone can play this epicurean game. As far as I’m concerned, the only requirements are happy and fun ;) And this past Christmas, my family and I met those requirements. We played the spaghetti carbonara wine pairing game. First I thought a wine with high tannins was way to go. A Nebbiolo, a Malbec or a Cabernet Sauvignon would stand up to the fat quite well but those wines are big and bold. With those, I was guaranteed to lose my guests halfway through dinner! An appropriate red would be light-to-medium bodied with high acidity, such as a clean and vibrant Gamay. The Gamay varietal –used to make Beaujolais– has plenty of acidity to cut through the silky fat of the pork and rich luscious sauce. It also has enough fruit character to complement the punchy peppercorn and asparagus. But not so fast! Though this wine would certainly make a good pairing, it lacks the earthy qualities and rustic charm I love so much. Naturally, my next move was white wines. A couple varietals from the Rhône region of France such as Viognier or Roussanne would certainly fit the bill. Their combined floral, herbal and fruit notes would complement the pasta dish nicely but their sugar content can be slightly high in some cases. Another suitable varietal is Pinot Grigio from Italy or Grauburgunder from Germany. It is a crisp, clean, and immensely food-friendly white. It originates from its sister grape called Pinot Gris grown in the Bourgogne region of France, well known for its strong mineral content. Minerals in wine work well with creamy sauces and ham. At this point, I really felt like I was getting closer to an exceptional wine pairing. I started thinking about Chablis, one of the most famous French white wines, also from the Bourgogne region. Chablis is made with Chardonnay, a grape that grows particularly well in the region. And then it hit me… Chardonnay! I suddenly remembered a great bottle I got from the nice folks at Grgich Hills Estate & Winery. This Napa Valley estate grown Chardonnay is fermented and aged 10 months in French Oak. 2014 was an exceptional vintage. Winemaker Miljenko “Mike” Grgich says: “Napa’s typical warm days and cool nights created wonderfully flavorful grapes. They achieved perfect ripeness with lower alcohol content. 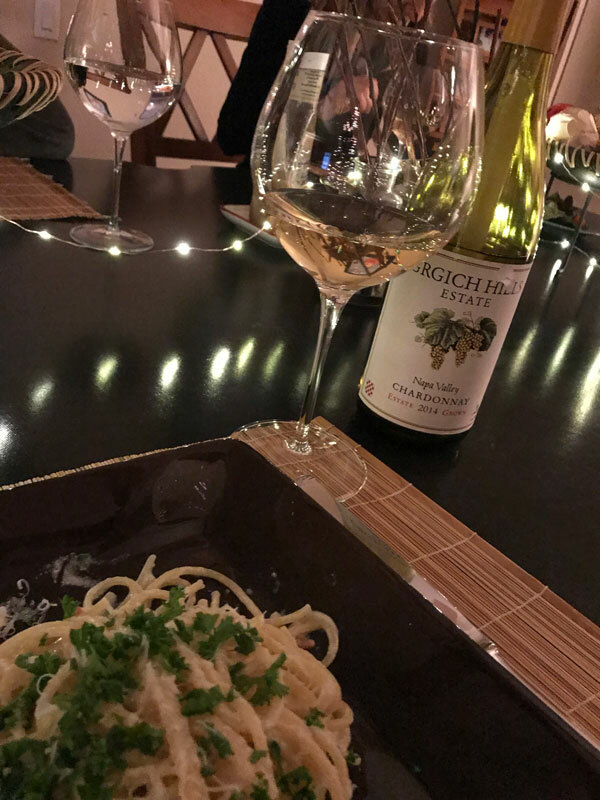 The wine displays ripe peach, mango and tropical flavors, with a note of minerality.” I made sure to chill the wine to about 50º and the result was fantastic! Wine pairing is a very subjective matter, yet it evolves around a clearly defined set of rules, sort of a guideline for wine amateurs such as myself. I came across a strange one online, something about “making sure that your wine is slightly sweeter than your chocolate”. I disagree! And that’s the beauty of the wine pairing game… Make your own rules! Our last course was a yule log, a classic French dark chocolate dessert. Without much confidence, I took a sip of the Chardonnay that was left in my glass and wow! I was quite impressed –and pleasantly surprised– by how well the wine complemented the dessert. 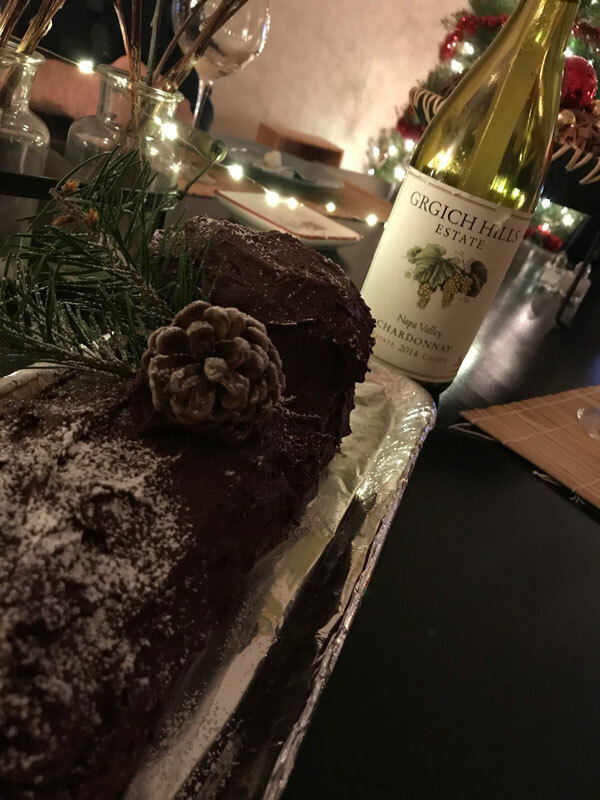 The mild tropical flavors of the wine were a nice addition to the roasted cacao butter cream, while its minerality and fresh acidity gave it a cleansing and cool finish. Can dark chocolate be paired with a Chardonnay? Well obviously, the answer is yes. While a creamy milk chocolate goes well with a light-bodied Riesling or Sauvignon Blanc, a dark chocolate dessert will be an ideal match for a Chardonnay. Now that you know, it’s time to taste! Let me know about your own wine pairing experiences. Great article, artfully written, so much related info seamlessly woven into what would appear to be a very specific issue. I learned a ton and will read the 5 pieces given at the bottom. “Get a handle on Pairing” is at the top of my Wine to-do list, but I’m not making much progress. This may jump start my efforts. Thank you Karl! I appreciate your feedback, always.